You’ve made it. You’re nearly finished with your senior year of high school and you can’t wait to take the next steps toward your future in college. College…that’s the tough part isn’t it? By this point you’re probably dizzy from all the campuses you’ve toured and the pile of acceptance letters at you’ve accumulated. Now that you’ve seen the scholarship options from these schools you’ve probably nailed it down to a top two or three. And by this point you just want to make a decision so that you have a concrete answer to the dreaded “What are your plans for next year?” question. 1. Does the school offer the major you’re interested in? (And a variety of others in case you change your mind?) Students change their majors much more often than you may think, so even if you can’t predict what you might change your major too, at least look for schools that offer a variety of programs that appeal to you. 2. Are you comfortable with the distance from home? Whether you want to go to school across the country or in your hometown, be sure to think about if you’re comfortable with the distance from home. Consider how often you’ll be able to make the trip home (and how worried your mom will be if you go too far away). 3. Were you offered any grants or scholarships that will make paying for school manageable? College is expensive, which means that schools that don’t offer you large enough scholarships will probably have to be thrown off the list. Don’t forget to look for outside scholarships that can certainly help you pay your way. 4. Do you like the campus? It’s layout, the way it looks, the residence and dining halls? Even if you like everything else, if you don’t like the way a campus looks or feels then you probably won’t end up loving the school. These are the buildings you’ll be taking classes, studying, eating and living in for the next four years—liking them is important. 5. What are the major pros and cons of coming to school here? Go ahead and write it out, when you’re able to see your likes and dislikes in front of you may be able to better understand what is most important to you. 6. Will you be happy calling this school home for the next four years? Loving everything about the college you choose may be impossible, but if this is a place where you can be happy, see yourself grow and ultimately become a better person, then without a doubt, that is the school for you. Now I must admit that the college decision was much easier for me than it is for most people. In fact, I did exactly what all admissions counselors tell you not to do and only applied to one school. Thankfully, Loyola wanted me and offered me a generous scholarship. For me, LUC checked off all the boxes I needed: plenty of majors, a beautiful campus, academics that would challenge me, Chicago (enough said), opportunities to study abroad and ultimately a place where I could be transformed. So you’ve finally decided on a college, it was a long process, but you’re here. You went on countless college visits, received way too many college letters, felt pressure from your parents as you filled out applications, and now you’re home free. All you have to do is buy some extra-long twin sheets and meet your roommate. Oh, and pick a major. As soon as you step onto a college campus there is pressure to know exactly what you want to do with your life. But if you are anything like me then you aren’t quite ready to commit to a major. I assure you that you can rest easy because guess what? You’re 18 and you don’t have to have your life figured out. 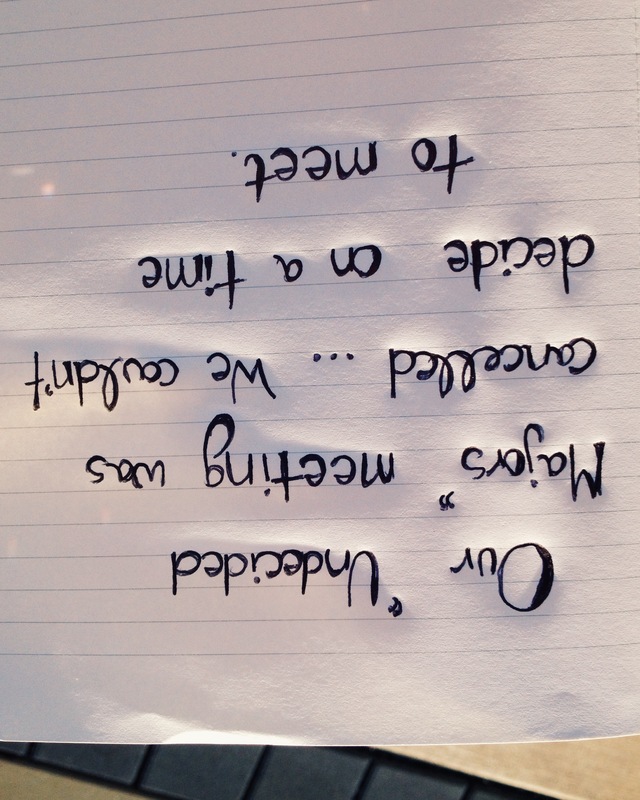 So as a college sophomore -who is still technically an undecided major- I want to help you navigate the nearly uncharted waters of the Undecided Major. When other people tell you a detailed plan of their major and career path you’ll feel a little awkward telling them that you just don’t know yet. You won’t have a group of friends from within your major right off the bat, so you’ll have to wait on ordering a “Quinlan School of Business” or “Marcella Niehoff School of Nursing” t-shirt. You might get stuck. Now that I’m going on year two of being undecided I’m pretty comfortable where I’m at, but am also feeling the pressure to choose a major soon. This has made it tough for me to abandon the Undecided Major ship. When people ask you what your major is you get to be creative in your answers like, “Oh, I’m just here to hang out” or “I’m majoring in a little bit of everything” or “I’m majoring in the Magnificent Mile”. These answers might spark some genuine concern, but I get the most worried facial expressions when I say, “Nothing”. Meeting other Undecided Majors is the best feeling in the world because they know exactly what you’re going through. Your freshman year is going to consist of a lot of CORE classes, which is good for two reasons. You get to explore a lot of different academic areas that may help you decide on a major- while staying on track for graduation. Plus you’ll finish your CORE in a timely manner and won’t be a senior taking UCLR (University Core Literature Requirement). I highly recommend starting your undergrad years as an undecided major, because we’re young and our thoughts about the future change. But don’t forget that Loyola won’t actually print you a degree that says “Bachelor’s of Undecided”. Don’t panic about starting college without a major. It’s definitely scary at first, but you’ll learn to own it and eventually learn to let it go. 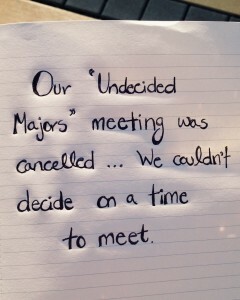 Who knows maybe next year we can get some “Undecided Major” t-shirts, too. Find Yourself at Open House! As the on-campus event coordinator in the Undergraduate Admission Office, some of my favorite weekends of the year are coming up – our Fall Open Houses! This year we will be offering two Fall Open Houses on Saturday, October 18th and Saturday and Saturday, November 8th on our Lake Shore Campus for High School Seniors, High School Juniors, and Transfer Students. Open Houses are a great way to spend some time on campus to see if Loyola is the best “fit” for you. All of the different tours, sessions, and activities are designed to introduce you and your guests to the Loyola community. Open Houses at Loyola differ from our daily campus visits in that they offer students, parents, and guests insight into the entire Loyola Community. We offer presentations on: Freshmen Admission/Scholarship, Transfer Admission/Scholarship, Financial Aid, Study Abroad, Pre-Health Advising, Career Development & Experiential Learning, and Residence Life. We offer tours of the Lake Shore Campus, all first year Residence Halls, and the Institute of Environmental Sustainability. We also offer a Department Fair where guests have the opportunity to meet with faculty, staff, or students from every major at Loyola. Click here to register for Open House! Click here to view the full agenda for Open House!